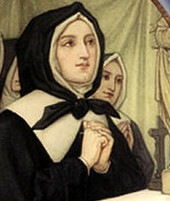 St. Marguerite Bourgeoys was a French missionary who came to Ville Marie (Old Montreal) in 1653. Marguerite strongly believed in Christian education where the school and family participated in their child's education. She also believed that girls and boys should have equal education opportunities. She founded a non-cloistered community named the Congregation of Notre Dame. On October 31, 1982, Pope John Paul II proclaimed her a saint. She is the first Canadian woman to be canonized. St. Marguerite Bourgeoys School in Innisfail proudly opened its doors in September 2003. We are celebrating our tenth anniversary throughout the school year. Community launches its first Catholic school with 85 students. Establishing a Catholic presence in a new community might not be as difficult today as it was for 17th-century Canadian pioneers. But beginnings are a struggle in any era, and the dedication to faith portrayed by a French missionary in Quebec is the basis for values and curriculum at St. Marguerite Bourgeoys Catholic School in Innisfail, says Wanda Lehman, the school's principal. "Sisters from the Congregation of Notre Dame have been in this community for quite some time, and St. Marguerite was their founder," Lehman said. "It just fits so beautifully because her spirit was here before the school." Leasing a small portion of the existing John Wilson Elementary School - once the largest public elementary school in Alberta with 800 students - St. Marguerite's was to celebrate its official opening and blessing Oct. 17. There have been some obstacles encountered in getting the pre-kindergarten to Grade 8 Catholic school operational, but Lehman says that with the help of the community, the initial few weeks have provided a sense of the difficulties experienced by the school's namesake. "Our current enrollment is 85. Each year we hope to grow and we know there are Catholic families who, for one reason or another, haven't registered their children into this school. They're probably just watching to see how things are going," she said. Lehman has observed older students freely giving their time at noon to assist little ones with opening their lunch containers or helping them tie their shoes. She has been awestruck watching them as reading buddies share stories and time together. "It's been amazing - a wonderful experience. At our parent advisory council meeting, I brought out the chairs and the next thing I knew, I needed another 20, 30 more chairs. The support has been phenomenal. "We are witness to a group of strangers becoming a caring community," the principal said. Lehman spends much of her time establishing contacts in the community to produce what she describes as a strong triangle - a partnership between home, school and Our Lady of Peace Parish. The parish elders have donated Bibles to the school while the Grade 7 and Grade 8 students, in turn, will pair up with Rosefield Centre senior residents to play cards and socialize. Lehman has been approached by the parish council, the Catholic Women's League and the Knights of Columbus offering their services. St. Marguerite Bourgeoys was a self-described "frivolous" person who, in 1640 and barely out of her teens, had a spiritual awakening at a procession for Rosary Sunday. She relinquished her fashionable European clothing and withdrew from a bustling society to give herself to the service of God. In 1653 she travelled to Montreal and became the new settlement's first teacher, opening its first official school in 1658. Smaller schools would soon flourish under her guidance, where the poor and the native peoples received a strong, basic education and instruction in their faith. Vocational schools in cooking, sewing and the arts as well as teacher training schools were directed by the Sisters of the Congregation of Notre Dame in Montreal. St. Marguerite Bourgeoys School's motto is Building the Reign of God, One Child at a Time, which Lehman finds relevant to any generation. "People were dedicated to bringing new Catholic education to their community," she said. "They are the pioneers of the area in those terms because we are starting from scratch. We are building culture because there haven't been Catholic schools here. "In just the first month we have noticed a tremendous growth in terms of the quality of prayer and the student's understanding of prayer. I think those who are here were looking for a spiritual dimension for their education. Right now, there is strong support for the program and people are quite happy. That's what we're hearing." Bill Hoppins is a former principal of John Wilson School who is now the superintendent of Greater St. Albert Catholic Schools. He remembers instilling a Catholic presence in the Innisfail public school. "We had a member of the Sisters of Notre Dame (Sister Anna Cordeau) teaching at the school. As Catholics, we tried as much as possible in a public school system to share our Catholicity and our belief in Christ, in an appropriate way." Hoppins began staff meetings with some 50 people, by putting chairs in a circle and having the members take a turn giving thanks. "It might take 10 minutes, but the Holy Spirit was alive and well in those gatherings." As an active member of the parish, Hoppins worked closely with the ministerial association to give Grade 5 students religious education with an ecumenical approach. He said he encountered no problems with the community. "I'm confident the spirit is still there and that they will share cooperatively with St. Marguerite's," he said. "My prayer is that a bridge is built between the two facilities because it's a change for the community and it can be challenging in that the people might be divisive about the two schools." The community immediately embraced Sister Cordeau when she arrived from Eastern Canada in 1979. She taught at John Wilson until 1986. The faith was not something Cordeau could openly teach in the school. But values were well taught, she said. "John Wilson was a wonderful school, but if you wanted Catholicity you had to go somewhere else." Cordeau said concessions were made every Wednesday when the teachers would leave their rooms when the bell rang at 3:30 p.m. to allow the Catholics to teach catechism. Pallotine Father Gottfried Seifert, pastor at Our Lady of Peace, says the community has been so enthused with the new school that the apprehension of older students has eased. "It is exciting, but at the same time to start a new school means they really have to blaze the trail," Seifert said, a former teacher in Calgary. "Nothing is set up. Something is usually missing and things have to be ironed out. They have to put up with a lot of difficulties. But there is a very good spirit among the teachers. "At first, the reaction of the children was not so easy with the older ones who had friends in the public school. It was difficult, but when I go to the school now, what strikes me is the children are happy. There is a very good atmosphere," he said. "This is most important."